And you love to dance, or watch dancing, that’s why we are all here, right? To share the experience of dance. I was asked that question 6 years ago and only last night did I figure out the answer. I had one of those weird moments where you remember something that you’d forgotten for so long that it almost doesn’t seem real; a dream, something you saw in a movie, but it was me. I know it. I was having trouble getting some technique down in my lesson with Tina. One of my tools to get past something that I can get into my body is to do a silly dance. I shook my body in a way that was familiar but totally foreign to Ballroom. Tina started to giggle as I did it, me needing no excuse to continue a silly dance continued. Tina remarked about how it sort of started to look like an African dance and that’s when it hit me. I know what the impulse was to go to that first belly dance class. I remember so vividly now. It was the drumming. I must have been 7 or 8, I remember standing next to the bar in a cold huge dance studio. My hand when it reached up for the bar was very close to my head. We were somewhere in Manhattan. I was uncomfortable. I had no idea what I was doing there. It was dark outside. The studio was lit so everything was bright, there were no shadows to hide in. The teacher was loud, exuberant and intimidating and there were drummers. There must have been 4 or 5 of them in the corner and when they started playing they cast their spell. In spite of my size, my timidness and my instinct to freeze and not do anything, it was impossible to not move. 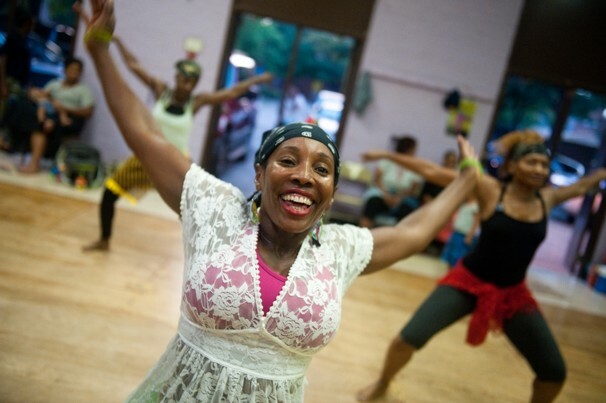 My mother had taken me to an African Dance class. I still don’t know why she took me but thinking about it now, it is my favorite thing I’ve ever done with her. How could I have possibly forgotten? The class was structured sort of like a Ballet class. We stretched at the bar, we learned different steps and then applied them to a small choreography that was done in the center of the room. I must have just committed to doing everything at a certain point because I remember thinking, “I can do this, I can reach and stretch and hit the beats.”. For someone who has suffered their whole life with extreme fear of doing anything in front of anyone, this is rather significant. In spite of my age, being raised by musicians, I did have an acute awareness of what it meant to be in front of people and to perform and I HATED IT. Even the idea of it. The panic that it created was paralyzing, yet here I was in a dance class thinking, “I’ve got this.”. Possibly the first time in my life I’d ever recognized and had confidence in any of my abilities. The end of class came too soon and it was time to pay honor to the drums. Every one lined up and went in pairs with the choreography that was learned. The dancers were so powerful. Their strikes on the beats could have knocked out Mike Tyson from 10 feet away and I wasn’t scared of them. The bodies were so beautiful, making shapes with their arms that extended through their backs like wings glistening with sweat. I wanted to be like them. It was our time to go down the line. My mother looked down at me, “Are you ready sport?” And we went. I was free. I went for it, hurling my body down the line. But what made that moment the most awesome thing in the world to that 7-year-old was that we went together, mother and child. Me being as little as I was and having no idea what I was doing, I must have looked ridiculous, but I took it so seriously and I remember thinking my mom was an amazing warrior and that because it felt so good, because I was sweating and out of breath, that I must be one too. We never went back (don’t know why, I’m guessing because my mom lost interest or got too busy raising me by herself) but clearly the damage had been done. I’d experienced something that I was never going to forget. It laid dormant for 18 years and rose up when there was another chance to heed the calling of the drums. This entry was posted in african dance, American Tribal Style, ballet, ballroom, ballroom dance, belly dance, dance, Uncategorized and tagged african dance, Ballet, Ballroom, ballroom dance, Belly Dance, belly dancer, Dance, feature length documentary, rachel brice. Bookmark the permalink.